Households in Colorado with income less than 80 percent of the area median, also known as income-qualified households, may face utility bills up to 15 percent of their net household income, depending on the season, reports show. In comparison, non income-qualified households typically pay less than 4 percent for their utility bills. To help alleviate a portion of this utility cost burden, Glenwood Springs-based Holy Cross Energy is partnering with GRID Alternatives Colorado and the Colorado Energy Office to implement an income-qualified community solar array project. Currently underway at the Cooley-Mesa campus in the town of Gypsum is the construction of a 145 kilowatt solar photovoltaic array. The estimated cost of the array is $450,000. However, this cost will be reduced by a $205,000 grant awarded to the project. HCE will own, operate and maintain this array. When completed, the array will produce approximately 218,000 kWh/year of clean, environmentally friendly electric energy – enough to meet the needs of 18 to 20 local homes this year. The project is designed to help establish monthly electric bill credits for eligible income-qualified households that receive service from the electric cooperative for a two-year participation period. On an annual basis, this program is expected to provide a 50 percent reduction in the participant’s electricity bill, resulting in tangible utility savings for income-qualified households. All eligible participants receive, with no up-front cost, a pro rata share of the generation capacity of the solar array. This percentage is applied to the actual monthly production of the array. Their calculated kilowatt-hour production is then multiplied by a preset energy rate to determine the bill credit. Though bill credit amounts may exceed the actual amount due, a minimum electric bill will be paid monthly by each participant. Any excess bill credit amount will carry forward to the next month. A unique feature of this project, intended to manage overall costs, is the community “barn-raising” approach for installing the array. There will be several volunteer day opportunities for qualified program participants, elected officials, HCE employees and board of directors, and others to roll up their sleeves and furnish some sweat equity for the benefit of the project. GRID will be responsible for the administration, coordination and selection of the first group of income-qualified households to participate in the project. A 130-acre solar farm three miles east of downtown Fort Lupton is now producing power. The project began in late 2014 after Brighton-based United Power initiated an effort to incorporate cost-effective renewable energy sources to help meet renewable energy goals. Partnering with solar developer Silicon Ranch Corporation, Silicon Ranch will own and operate the solar farm, while United Power receives all the energy produced over a 20-year period. The 13-megawatt farm is expected to produce about 30 million kilowatt hours of electricity per year from approximately 150,000 solar panels – enough to power 3,100 homes. The solar field is a single axis tracker, which means that the panels follow the sun throughout the day. This generates about 25 percent more energy than a traditional fixed panel system. 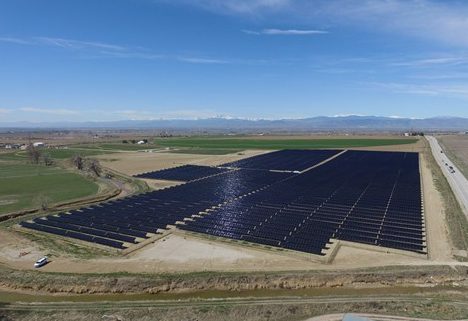 The Fort Lupton solar site, along with other renewable projects, helps United Power meet its statutory legal requirements to have 20 percent of its generation produced with renewable energy. It also generates a margin for United Power which correspondingly helps all its members by stabilizing future rate increases. Another two-megawatts of solar energy is coming to Fort Collins, increasing Poudre Valley Rural Electric Association’s energy portfolio. Through a 20-year Power Purchase Agreement with Silicon Ranch Corporation, over 24,000 more solar panels will be added at the existing Skylark Solar Facility in Weld County. “With the continuation of added load to our system and the competitive pricing large-scale solar projects offer, adding another source of renewable energy to our members’ local electric grid makes sense,” PVREA CEO Jeff Wadsworth explains. Dubbed Skylark II, construction recently started and PVREA hopes to see these panels energized by the end of 2016. Learn more about PVREA’s renewable energy projects at http://www.pvrea.com/programs/renewables. Josh Dellinger (foreground) and Clint Rapier measure the framework that will hold the solar panels. A collaborative effort between three renewable energy supporters made Empire Electric Association’s Solar Assist Cooperative Garden a reality. 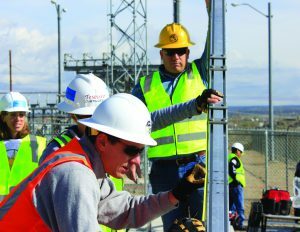 The story of the partnership between the Cortez-based electric co-op and GRID Alternatives, a nonprofit from California, started when GRID reached out to EEA through the Colorado Energy Office. By February 2016 the agreement was in place between EEA and GRID and construction began. The arrays were completed in April, thus making EEA the first system in the state of Colorado to partner with the Colorado Energy Office and GRID. GRID received $1.2 million in grant money from the Colorado Energy Office to partner with Colorado co-ops and bring community solar to low-income families. GRID made a proposal to EEA for the installation of the 70 solar photovoltaic panels that produces 21.35 kilowatts in these arrays. In addition, GRID promised to be on site to train and lead teams of community volunteers and job trainees installing the solar structure. Through this program, five to 10 qualifying EEA members will see a reduction on their electric bills depending on how much energy the arrays generate. 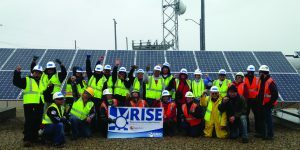 The volunteer solar installers included three Empire Electric employees, including Dellinger, as well as Montezuma-Cortez High School senior students, potential solar subscribers, student trainees from the Navajo Technical University in New Mexico and residents from Cortez. The preparation for the expansion was completed and ready for the volunteers to finish the project in two days. Upon arrival, the volunteers were issued a hard hat, safety glasses, work gloves and a reflective vest. GRID divided the community volunteers into work teams headed by a GRID team leader. The volunteers got to work and eagerly helped assemble the arrays. Day two included a dismal forecast of rain and snow. The job for the day was to secure and connect solar panels to the gleaming double tracks that were installed the previous day. Panel cables were attached to the inverters and the panels were secured using special fasteners. Once the cables were attached, a light flashed on the inverter, completing the connection. Cold, wet and job complete, the volunteers pose for a group photo. EEA system engineer Clint Rapier volunteered at the project and was impressed by the preparation GRID Alternatives made: the preassembled tool kits, personal protective equipment, safety plan, briefing and organization. “It was apparent GRID had done this before and had refined the process,” Rapier said. “Volunteering brings a sense of pride when working on projects for our community,” said EEA communications specialist Denise Moore, who also volunteered on the project. “Even though it was cold and we were soaking wet, everyone was there to get the job done. Working with such positive people made the job go quickly, and it was an inspiration to be involved in this uplifting community project. The Solar Assist Cooperative Garden is located on EEA’s property in Cortez where it is maintained by the cooperative. Members can lease solar panels for a 20-year period and receive credit for the power generated by their panel.